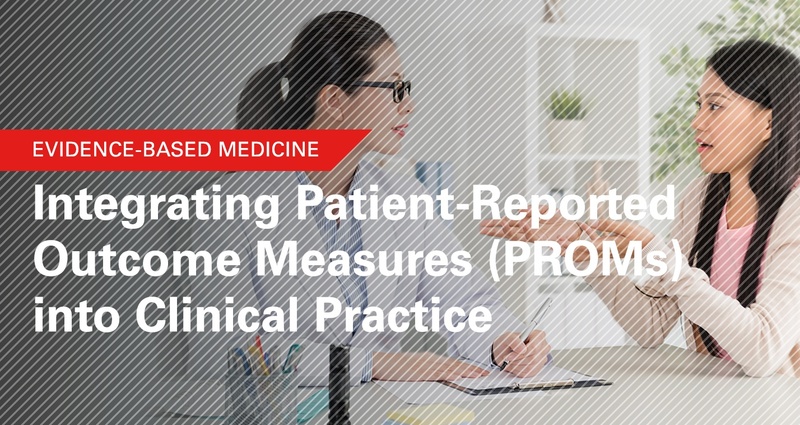 Assessing patient-reported outcome measures (PROMs) has become more prevalent throughout the healthcare field. By collecting PROMs, physicians gain insight into each patient’s care experience and view of his or her own health status. This quantitative data has been shown to benefit clinicians, researchers, and patients alike. Randomized controlled trials have shown that PROM use improves patients’ quality of life and emotional well-being. PROMs have also been associated with enhanced patient-provider communication, streamlined monitoring of adverse events, and initiation of quality improvement measures. How, when, and where PROMs should be incorporated into medical practice, will vary by clinician and/or institution. The following article highlights four real-world clinical scenarios and successful data collection techniques, providing physicians with options to consider when developing their own nascent PROM collection programs. In each scenario below, otolaryngology practices outline their rationales for choosing a PROM method, describe their data collection processes and applications, and identify key elements of success. One private practice group collects PROM assessments from patients receiving four common treatments: hearing aids, immunotherapy, nasal/sinus surgery, and pressure equalization tubes. Patients complete both a pre-intervention paper questionnaire and a follow-up phone survey post-intervention (six months to one year later). Validated tools used are the Hearing Healthcare Questionnaire, Rhinoconjunctivitis Quality of Life Questionnaire, Sinonasal Outcome Test (SNOT-22) and OtitisMedia-6 instrument. Follow-up phone calls by a designated office staff member led to the highest rate of data completion. This PROM assessment sparked a performance improvement initiative and staffing change that resulted in significantly improved group outcome scores within the audiology department and was deemed to add value to the organization as a whole. An academic laryngology practice collects the Voice Handicap Index-10 and the Reflux Symptom Index from all patients at every visit. The clinicians employ PROMs both for patient-care-related and research purposes. Medical assistants manually input data from the paper forms into the EMR, and paper forms are also scanned into the EMR for future reference. Response rate is extremely high, as patients are not seen by a clinician until their surveys are completed. Notably, accurate and timely form completion may be a challenge for non-English-speaking patients needing interpreter assistance for each PROM assessment. One academic group rhinology practice uses PROM assessments both for research purposes and to trend patient outcomes. The SNOT-22 is a validated symptom survey that is administered to all patients with chronic rhinosinusitis at every visit. Medical assistants manually input data into EMR flowsheets so that symptom severity can easily be tracked over time. Data for research are subsequently entered into REDCap, a HIPAA-compliant electronic data capture platform. As in the previous scenario, response rates are high, as patients complete their forms prior to their appointments. The clinicians anticipate improved patient outcome assessment with the addition of tablet-based input methods and the incorporation of data into quality metric reports. A facial plastic surgeon in a tertiary practice uses the NOSE survey to create individualized treatment algorithms for patients with nasal obstruction. PROMs are obtained strictly via tablets and follow-up emails, and all data is entered directly into the REDCap database by the surgeon. In this model, a designated computer programmer and clinical research coordinator are pivotal to the maintenance of the integrated EMR-REDCap system. Response rates have been approximately 85% for this model. One obstacle to use is the burden to the physician who must input data on every patient. PROMs have been integrated into clinical, academic, and research-oriented medical facilities. Paper forms are still common, though EMRs can now be used to seamlessly integrate a patient’s self-reported data into his or her clinical record. The development of a standardized PROM assessment is an important area of research potential. Eventually, a shared data set accessible to a vast network of providers and institutions could enhance both patient care and research efforts. The implementation of PROMs throughout the medical field is advantageous for patients and clinicians alike. Though data collection processes vary widely, PROMs have the collective potential to revolutionize healthcare delivery by promoting a patient-centered model of practice. Carroll, TL; Lee, SE; Lindsay, R; Locandro, D; Randolph, GW; Shin, JJ. “Evidence-Based Medicine in Otolaryngology, Part 6: Patient-Reported Outcomes in Clinical Practice.” Otolaryngology – Head and Neck Surgery 2018; 158(1): 8-15. Accessed September 12, 2018.